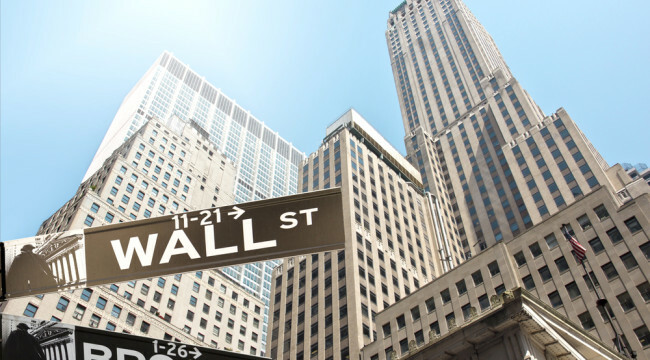 When Wall Street Gets DeFANGed - Look Out Below! As the stock market labored into this past Friday’s close, CNBC was apparently tying to help with a crawler saying that the S&P 500 was heading for its “best week of the year”. Then again, the gain of just 1% since New Year’s Day is not a whole lot to write home about. In fact, there were some fireworks in last week’s gains, but if history is any guide they were exactly the kind of action that always precedes a thundering bust. To wit, the market has narrowed down to essentially four explosively rising stocks—–the FANG quartet of Facebook, Amazon, Netflix and Google—–which are sucking up all the oxygen left in the casino. At the turn of the year, the FANG stocks had a combined market cap of $740 billion and combined 2014 earnings of $17.5 billion. So a valuation multiple of 42X might not seem outlandish for this team of race horses, but what has happened since then surely is. 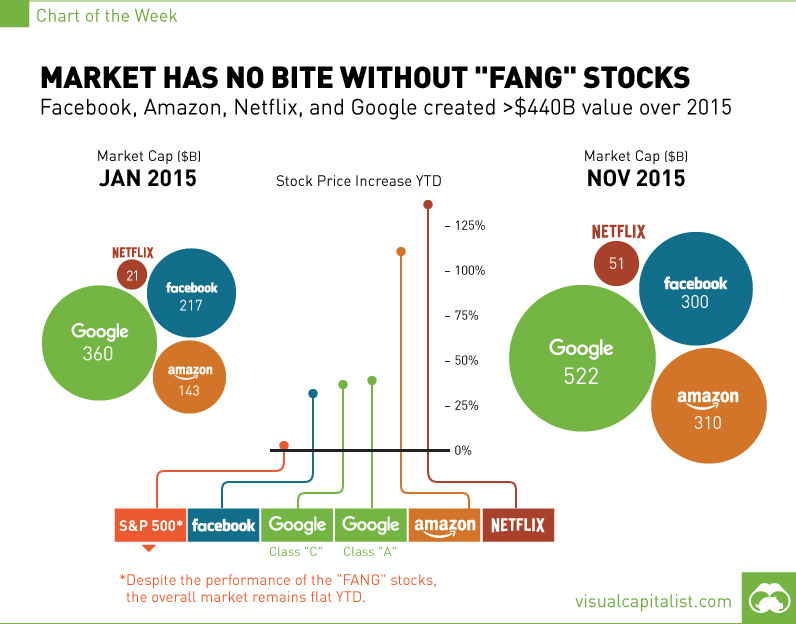 At last week’s close, the FANG stocks were valued at just under $1.2 trillion, meaning they have gained $450 billion of market cap or 60% during the last 11 months——even as their combined earnings for the September LTM period were up by only 13%. In a word, the gamblers are piling on to the last train out of the station. And that means look out below! 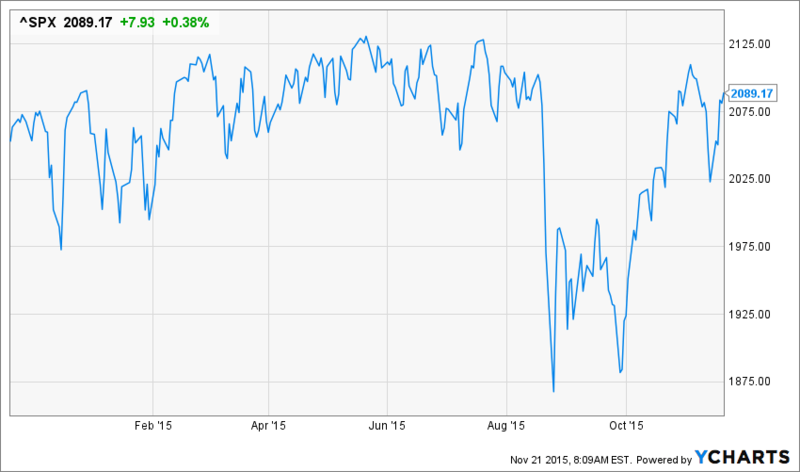 Indeed, the chart of the broad market (S&P 500) should be warning enough. It has been choppin’ to nowhere ever since reaching current levels last November. After 27 failed attempts to rally, last week’s 3% gain was surely just another spasm of the dying bull. That’s especially the case coming as it did on the heels of no positive domestic economic news, the onset of the fifth recession in 7 years in Japan, more cratering of credit in China, another plunge lower in Brazil and much of the DM and the specter of a Thermidorian Reaction to the Paris terrorism events in Europe. An old Wall Street adage holds that market tops are a process, not an event. A peak under the hood of the S&P 500 index, in fact, reveals exactly that. On the day after Christmas last December the total market cap of the S&P 500 excluding the FANG stocks was$17.70 trillion. By contrast, it closed at $17.26 trillion on Friday, reflecting a 2.5% or nearly half trillion dollar loss of value. And there is growing deterioration down below for good reason. Notwithstanding the FOMC’s stick save at every meeting this year, each near miss on a rate hike reminded even Wall Street’s most inveterate easy money cry babies that the jig is up on rates. Sooner or later the Fed would just plain run out of excuses for ZIRP, and now, after 83 straight months on the zero bound, it has. And not at an opportune time. The world economy is visibly drifting into stall speed or worse, and corporate earnings are already in an undeniable downswing. Reported EPS for the S&P 500 during the LTM ended in September was $94 per share or 11% below the $106 per share reported a year ago. So the truth is, the smart money has been lightening the load all year, selling into the mini-rips shown above while climbing on board the FANG momo train with trigger finger at the ready. Needless to say, this narrowing process is an old story. It famously occurred in the bull market of 1972-1973 when the impending market collapse was obscured by the spectacular gains of the so-called “Nifty Fifty”. And it happened in spades in the spring of 2000 when the Four Horseman of Microsoft, Dell, Cisco and Intel obfuscated a cratering market under the banner of “this time is different”. But let’s see. It’s more like the same old delusion that trees grow to the sky. 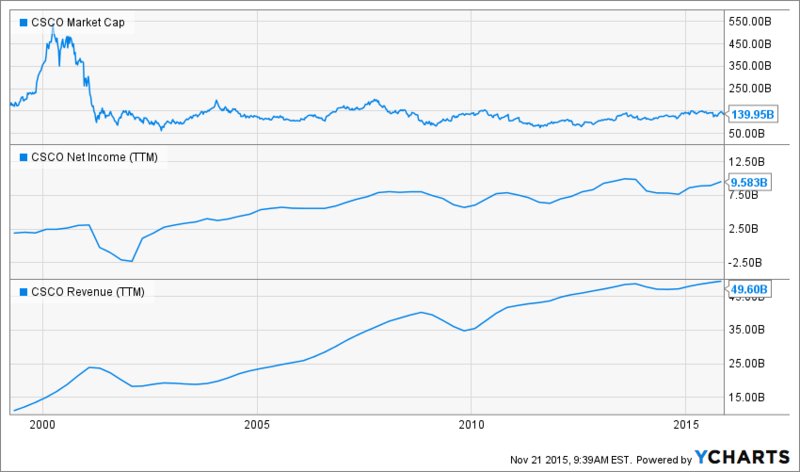 At its peak in late March 2000, for example, Cisco was valued at $540 billion, representing a $340 billion or 170% gain from prior year. Since it had earned $2.6 billion in the most recent 12 month period, its lofty market cap represented a valuation multiple of 210X. And Cisco was no rocket ship start-up at the point, either, having been public for a decade and posting $15 billion of revenue during the prior year. Nevertheless, the bullish chorus at the time claimed that Cisco was the monster of the midway when it came to networking gear for the explosively growing internet, and that no one should be troubled by its absurdly high PE multiple. The same story was told about the other three members of the group. During the previous 24 months, Microsoft’s market cap had exploded from $200 billion to $550 billion, where it traded at 62X reported earnings. In even less time, Intel’s market cap had soared from $200 billion to $440 billion, where it traded at 76X. Dell’s market cap had nearly tripled during this period, and it was trading at 70X. Altogether, the Four Horseman had levitated the stock market by the stunning sum of $800 billion in the approximate 12 months before the 2000 peak. That’s right. In a manner not dissimilar to the FANG quartet during the past year, the Four Horseman’s market cap had soared from $850 billion, where it was already generously valued, to $1.65 trillion or by 94% at the time of the bubble peak. There was absolutely no reason for this market cap explosion except that in the final phases of the technology and dotcom bull market speculators had piled onto the last momo trains leaving the station. But it was a short and unpleasant ride. By September of 2002, the combined market cap of the Four Horseman had crashed to just $450 billion. Exactly $1.0 trillion of bottled air had come rushing out of the casino. Needless to say, the absurdly inflated values of the Four Horseman in the spring of 2000 looked exactly like the FANG quartet today. Thus, Facebook reported $2.8 billion of net income in the most recent period, thereby weighing in with a 107X PE multiple. Likewise, Netflix currently trades at 307X its LTM earnings and Amazon at 950X. Even Google, which has now smacked into the law of large numbers with revenue growth of just 13% in the last year, is valued at 32X. Moreover, despite its overflowing creativity and competitive prowess, GOOG is not a technology company which has invented a rocket ship product with years yet to run. 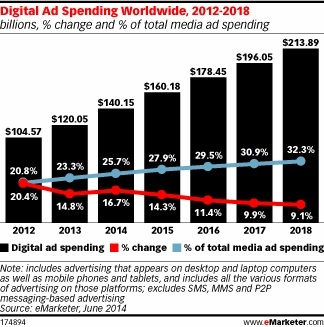 Nearly 90% of its $72 billion in LTM revenues came from advertising. But the current $575 billion worldwide advertising spend is a 5% growth market in good times, and one which will slide back into negative territory when the next recession hits. Even the rapidly growing digital ad sub-sector is heading for single digit land; and that’s according to industry optimists whose projections, as per the graph below, assume that the business cycle and recessions have been outlawed. The fact is, GOOG has more than half of this market already. Like the case of the Four Horseman at the turn of the century, there is no known math that will allow it to sustain double digit earnings growth for years into the future and therefore it 32X PE multiple. So here’s the thing. The Four Horseman were great companies that have continued to grow and thrive ever since the dotcom meltdown. But their peak valuations were never remotely justified by any plausible earnings growth scenario. In this regard, Cisco is the poster child for this disconnect. During the last 15 years its revenues have grown from $15 billion to nearly $50 billion, and its net income has more than tripled to nearly $10 billion per year. Yet it’s market cap today at $140 billion is just 25% of its dotcom bubble peak. In short, its market cap was driven to the absurd height recorded in March 2000 by the final spasm of a bull market, when the punters jumped on the last momo trains out of the station. This time is surely no different. The FANG quartet may live on to dominate their respective spheres for years or even decades to come. But their absurdly inflated valuations will soon be deFANGed. When that happens, look out below. P.S. Be sure to sign up for The Daily Reckoning — a free and entertaining look at the world of finance and politics from every possible angle. The articles you find here on our website are only a snippet of what you receive in The Daily Reckoning email edition. Click here now to sign up for FREE to see what you’re missing.